Mine nip. Mine Mine. That's mine nip. Leave it alone. I'm gonna sleep on it. Oh Angie you are definitely under the influence. He, he. Those are very cute nipped-out pictures. Yu look like me when Momma lets me have some nips. Hey, girls gotta have fun, right? Beau Beau...fank you fur the nice com-pee-ment on my pix-chur. Momma took dat pix-chur and had an oil painting done from it. Her eyes leaked when she got it back, she wuz so happy. She hung it up in the forbidden room(the bedroom). She say dat she wants to get paintings of all of us...but I don't udderstands cuz she has us why does she need to have paintin done? Beans are nutters, ya know? Come on ofur Beau Beau and bring Angie, I'll share my nips wif yu! Wow, Angie......do you think maybe you had a little too much? Oh, Angie! Yur brain felled out! That's what Mom says when we turn upside down wif that blank look. angie, you look furry furry adorable and floofy! Mom says your a big fluff ball Angelica. If your nipped out do you let anyone rub your belly?? My Mom doesn't get to rub my belly. 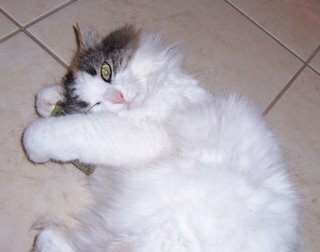 Absolutely yu's can use my pix-shur, I am *blush* furry honored! Boy dat nippin' wuz fun last nite!! Yu and Angie knows how to rock 'round da clock! 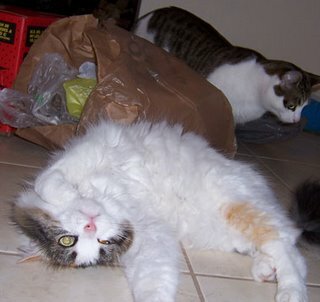 Wow you look like your having a good nip trip. 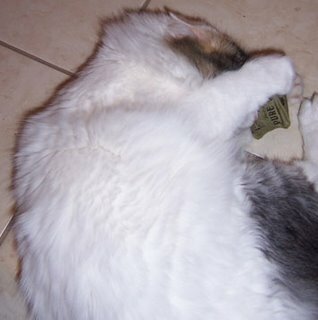 One look at those pics and I just had dig out the catnip for my Sammy Jo. He's rolling around and getting high as we speak. Thanks for stopping by earlier. whoa angelica! you got a serious nip problem. has you tried to gets help for it? you got that crazed look. we hopes you didn't scared beau beau to death. I hope you're at home in these pictures, or that you had a designated driver! What a fluffy belly! And you're sooo nippy there! Nice work! Dat nip looks like reel strong stuff, yoo wuz reely enjoying it. Hope yoo didn't haf too much of a hang-ofurr after. Hahahahahahaha! You look cute when you're flying high!